The Sikorsky UH-60 is a family of twin engined, medium-heavy lift military helicopters developed in the 1970s. 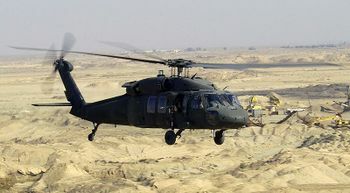 With over 1,500 in operation with all services, including 1,200 with the U.S. Army, the UH-60 is the most widely used aircraft in the U.S. Military. Civilian, non-military and export models are designated the S-70. This page lists all the films which feature a variation of the Sikorsky UH-60. For the civilian variant, see Sikorsky S-70. Pages in category "Sikorsky UH-60"
This page was last modified on 21 June 2010, at 18:36.